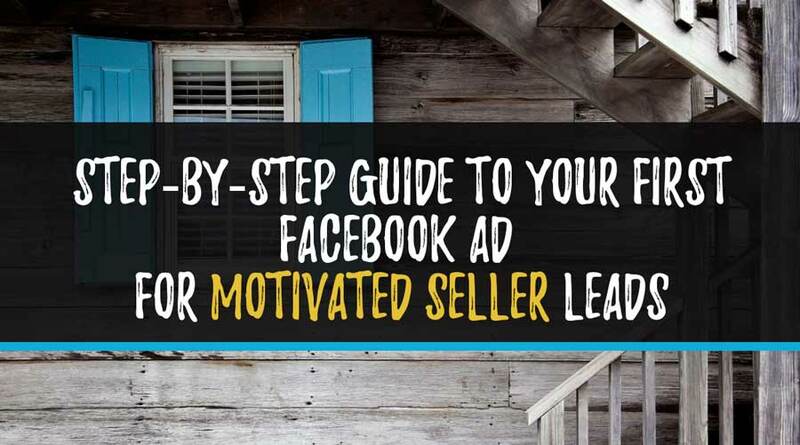 Using Facebook to advertise for distressed or motivated sellers doesn’t have to be scary, expensive, or risky, and this guide is meant to help you get started with your first easy, low-risk ad, with a tiny budget of only $10. In this way, you can get your feet wet so that you can begin to understand all of the mechanics and nearly unlimited potential of advertising using this channel, without losing your shirt. Once you start seeing how it all fits together, you will be ready to tackle more advanced techniques such as funnels, custom audiences, and retargeting which we’ll cover later in a more advanced guide. In this guide, however, we’ll start with baby steps. 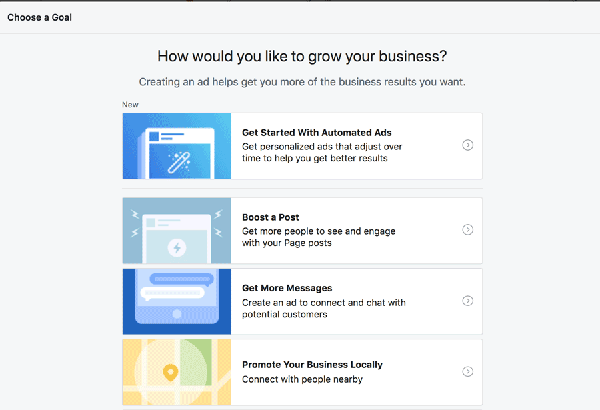 If you don’t have a Facebook Business Page set up already, I highly recommend that you set one up for your business for several reasons, not the least of which because it is a prerequisite for the rest of this guide. Setting up a business page creates a separation between your personal account and the account for your advertising. Even if you never plan on marketing the business page itself, it’s an essential piece of the mechanics of advertising on Facebook. In this tutorial, I want to get you up and running as quickly and painlessly as possible. 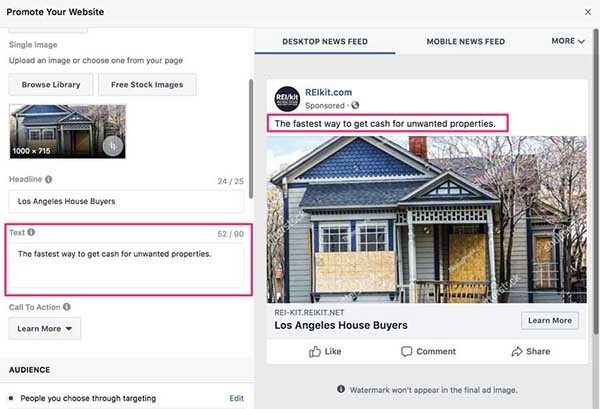 For that reason, I’m not going to talk about every feature of the Facebook advertising interface, but instead I’ll walk you through your options and then show you how to create an advertisement that will start sending traffic to your page right away. For simplicity, your first ad will be an ad created from your business page (option 2). Don’t worry if you have no likes on your page, and that nobody knows about your page yet. Although the ad will be posted on your business page, it will be shown to anyone on Facebook that meets your targeting criteria. This will bring up your goal selection screen. 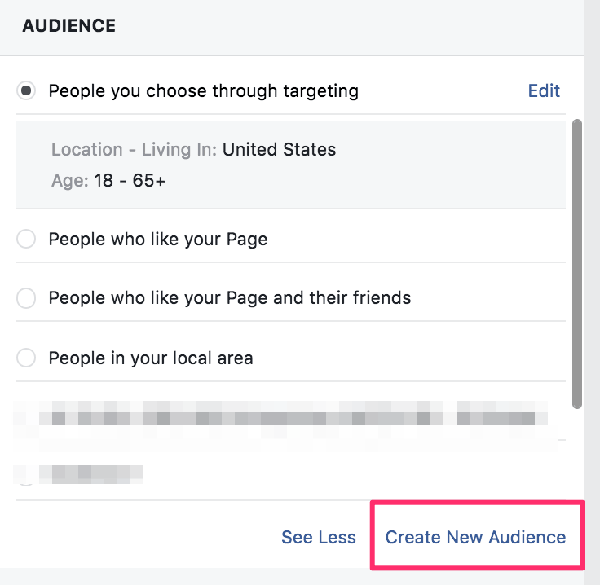 Goal selection helps Facebook determine the kind of audience to show your ad to, and also the metric that they will use to charge your account. Since you already have a REI/kit motivated seller lead page with its own website link, you won’t actually use the ‘Get More Leads’ goal. About Goal selection, Impressions, Clicks, and Leads and how Facebook charges for those. Facebook will charge for different goals either based on impressions, clicks, or leads, so depending on the goal that you choose you will be charged correspondingly. For example, A “Website Visitor” goal is charged based on impressions, whereas engagement with a post is charged based on clicks, and lead goals are based on submitted lead information. The further down the funnel that you go, the more expensive the conversion event is in Facebook. One consideration for example is your ability to convert a lead acquired using a Facebook lead ad that has much less information about what you do when they submit their info vs a lead acquired using a Facebook website visitor who submitted their information on your lead page that explains what you do. I will discuss those pros and cons more in the follow up advanced guide. However, for your first ad, this is a moot discussion, as Facebook only allows you to get charged for impressions for your first $10 in spend, and so the website visit is the only goal that matters. So for our first ad we’re going to click on the “Get More Website Visitors” goal. Now you can begin to create your ad. The first step towards creating your Website Visitor ad is to tell Facebook where you want it to send your visitors to. This is called a destination URL, and for this ad you want the URL of the Lead Page that you set up in REI/kit. Going back to your Facebook ad creation screen, paste the URL that you copied to your Lead Page into the URL field. Facebook will import some of the information from your lead page into the ad, such as your page title, logo, or meta-description. You can overwrite or completely remove this information and image. Next, you choose the ad format. Facebook allows you quite a bit of creativity and flexibility in creating your ad. 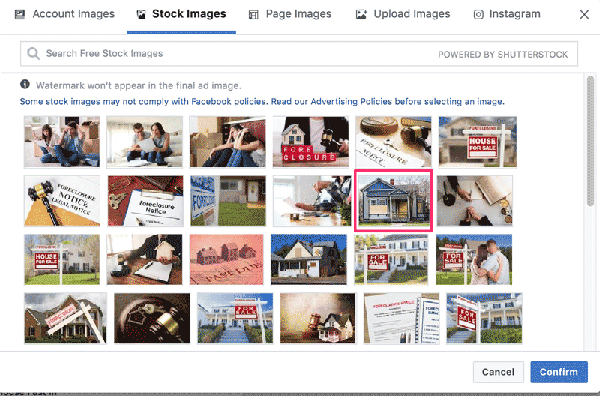 For each option, you are given the choice of uploading your own photos or a video, or choosing from Facebook’s free stock photos and slideshow music library. For uploaded photos, the photo specifications are: minimum 600 x 600 pixels, recommended 1080 x 1080. Try not to use text in your photo, and if you must, make sure it is not more than 20% of the image. You can ignore this for now as you will replace the image. For the first ad you’ll start with a single image. Select ‘Single Image’ from the drop-down list. In this guide we’ll choose from the Free Stock Images after typing in ‘foreclosure’ in the search field. Depending on what your real estate expertise is, you can choose a headline that suits your offering. When marketing, it’s always helpful to put yourself in the customer’s shoes and imagine a solution that will resonate with them. In other words, while “We Buy Houses” is the ad that we are creating now, there’s a possibility that the customer is not looking to get rid of their house, or they are not interested in how much you want their house for cash. They are looking for solutions that will help them lift a burden from their shoulders. If you can find a way to translate that into your photo and copy, it will go far in separating you from your competitors. In this field, your text describes the product or service that you are offering. 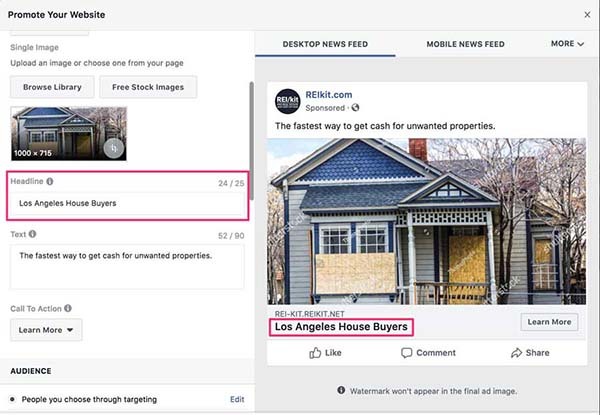 Generally speaking, for any types of advertisements involved with housing or financial situations you need to be very careful in how you approach prospective sellers or buyers, or risk getting your ad rejected by Facebook. is not acceptable, because you are attempting to single out the viewer rather than appealing to a broad audience that the viewer MAY be (not IS) a part of. In general, if you are asking a specific question, are using a question mark, or are including the words “other” or “your” in your ad, it’s probably too specific. So, for example, “We offer services to help with many financial situations” is more acceptable. No commissions. No fix-up. No fees. Get help with a house no longer wanted today. We buy houses that are not wanted. Click Learn More to find out how we can help today. The fastest way to get cash for unwanted properties. Most ads have a Call-to-Action button that helps the viewer take action. In the case of a Facebook ad, the CTA is the button that you want the viewer to click on that will get them to your website. There are a number of CTA texts available to choose from. In your case, “Learn More” is the most appropriate choice, since your leads are going to your website for more information about the solution you are offering. An Audience in Facebook is a group of people to show your ad to. Targeting can be both geographic, as well as based on other Detailed Targeting criteria like demographics, interests, or behaviors. 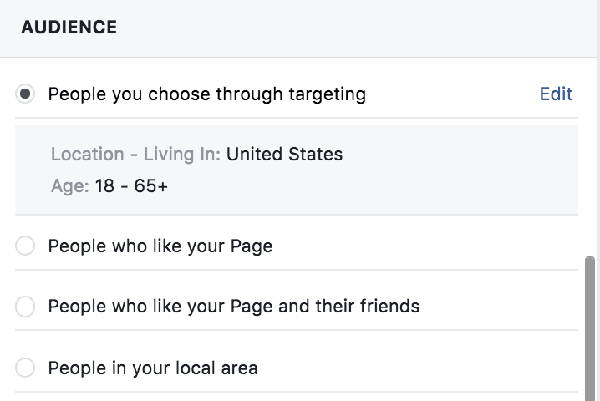 When you select an initial audience of “People you choose through targeting”, you will be presented with detailed targeting options that I will describe further below. When you complete this process, you will be able to save your audience and reuse it, so let’s create your first audience. Click on the “Create New Audience” button to start the process. Although the name of your audience is the first field that you will see, I recommend waiting to name your Audience until after you have finished entering in all of the targeting criteria. This is because you will be using those criteria in the name to distinguish different audiences from each other. It is good practice to try to follow a naming system such as: Gender – Age – Geographic Area/Radius – Demographics/Interests/Behaviors. At the bottom of the audience builder is a very important dial to take note of as you edit your targeting criteria. This dial will show you whether your audience is too broad, too specific, or just right. Another item to keep an eye on as you build your ad, that is visible in the above image, is the “Potential Reach,” the number below the audience selection statement. The Potential Reach provided gives a general idea of how many people your ad can potentially be shown to, depending on the size of the geographic area or how specific is the targeting that you choose. Don’t view it as a hard fact; It’s simply a guideline for how large or small your potential audience is so that you can plan and budget accordingly. The Potential Reach will change every time you make a change to your targeting. Notice that Facebook starts off the ad builder Audience set with both Men and Women, aged 18-65+, that live within the United States. Now, I don’t know a lot of 18 year old’s that own houses that they no longer want (unless inherited), nor do I want sellers outside of my city contacting me, and you might not either. Narrowing down our Audience based on the criteria of people we don’t want the ad shown to, is just as important as defining the criteria of the people we do. 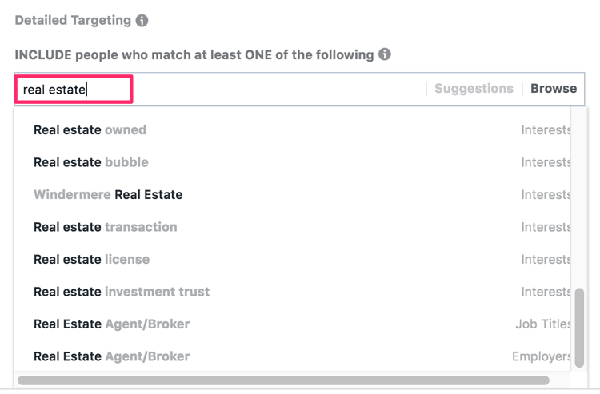 Now we get into the nitty gritty: Facebook’s Detailed Targeting options. Before we can specifically target a particular audience, we have to explain the three categories of targeting: Demographics, Interests, and Behaviors. Demographics are the characteristics of a population such as age, income, education, jobs. Interests are those words that a viewer has included in their Facebook profile, or that are included in pages they like or other areas. Facebook can provide Audiences that display a certain type of behavior. For example, you could include people who fit into certain multi-cultural affinities: African-Americans, Asian-Americans, or Hispanics. Note: do not advertise housing opportunities (if you are advertising a property for sale, for example) that are specifically aimed at populations of a certain multi-cultural affinity; this is against federal law. 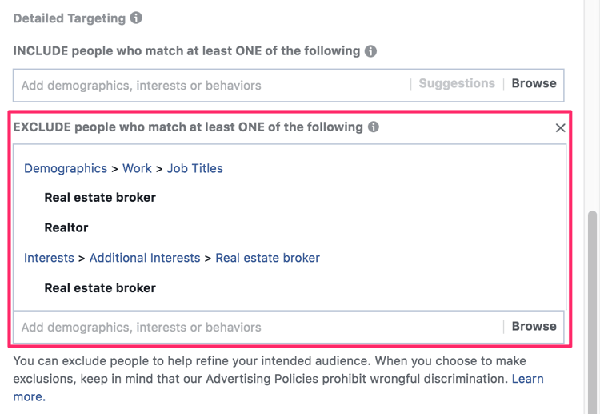 You will first want to select which demographics, interests, or behaviors to target in your ad by either searching for them, or browsing through the different categories. Because Facebook doesn’t allow you to target specific audiences, you have to get creative as to how to target the people that you think are most likely to be your leads. Trick of the trade: Think of and search for an interest or demographic or behavior that you believe the people in your target audience exhibit. Do they frequent a particular restaurant or establishment? Do they like a particular activity or sport? Do they have celebrities or political figures that they follow? TIP: Hover your mouse over the Demographic, Interest, or Behavior that was added when you clicked on it. Facebook provides the approximate number of people who are in that demographic, have that interest, or have displayed that behavior. On the other hand, you will also need to exclude Job Titles and Interests related to real estate: brokers and agents; these folks do not need your help selling their property, and you don’t want them clicking on your ad. This completes your audience selection and targeting. Now that you have all of your audience settings defined, you can go back and name your audience using your selections, and then click “Save” to save your brand new Audience. Once you have saved and closed your audience, next you will choose where your ad will show up. 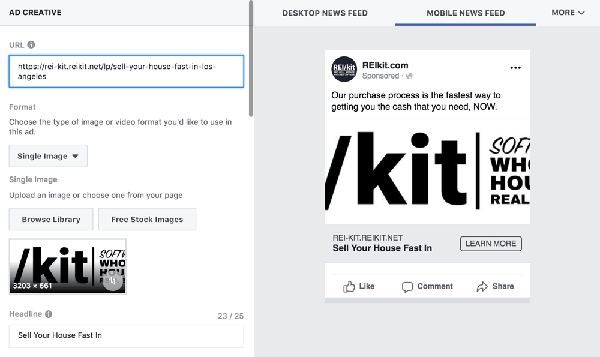 Desktop News Feed: Ad appears within the feed that most people view on the Facebook desktop site. Mobile News Feed: Ad appears within the feed on a mobile device. Instagram Feed: Ad appears within Instagram feeds. Instagram Stories: Ad appears within Instagram Stories. Messenger Inbox: Ad appears within the audience’s inbox on the Facebook Messenger app. 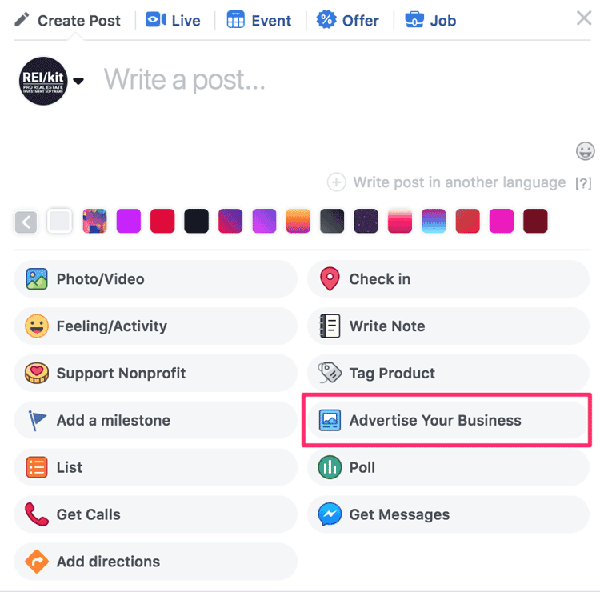 You should turn off automatic placements and uncheck the checkboxes next to Messenger and Instagram from the selected placements to ensure that your ad only shows up in the Facebook feeds. Why? Think about the age of your audience, and which platform they are more likely to be using. Since this is your first ad, you should set the budget low, at $2 per day. Important: In order to make sure that your ad stops running, make sure to select when the ad will end, otherwise it will run continuously. 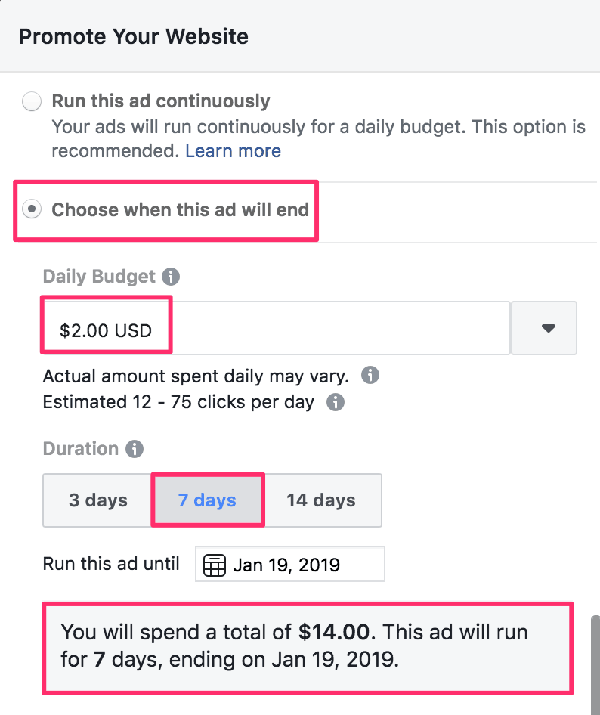 When you start with a daily budget of $2 you can either set the duration for 7 days, or use the calendar to set the ad end date at least 5 days from the day that you start it. Facebook will then tell you how much your ad will cost. You will see an estimation under the Daily Budget that gives you a rough approximation of how many link clicks (clicks on your ad or your Learn More button) you can expect for a given budget. After you have double-checked that your advertisement looks good in all placements, and that any errors have been resolved, click on the blue Promote button. Your ad will then be reviewed by Facebook and you will be notified when your ad is has been approved. This can take from a few minutes, up to a day. Once your ad is approved it will start showing to the target audience that you selected, until the end date that you set in the budgeting section.. The estimated link clicks will be just that, an estimate, but remember, while your lead page is optimized for conversions, this is still a numbers game. Your first ad’s targeting will determine your baseline for future improvement. So that if for every 100 clicks to your lead page you get 1 lead, then for your next ad, you will try to improve your targeting, to get 2 leads for every 100 clicks. In this guide I walked you through the entire process of creating an ad through your Facebook Business Page, using just $10 by following 15 easy steps. You should now understand the basic mechanics of creating these ads and should start seeing how you might be able to use different audience targeting options to attract leads.